Why Are Christian Soldiers in Egypt Harassed and Killed? Originally published under the title "In Egypt, Muslim Soldiers Slaughtering Their Fellow Christian Platoon Mates." On Sunday, August 23, a Coptic Christian soldier was killed in his army unit in Egypt. Baha Saeed Karam, 22, was found shot dead with four bullet wounds at the headquarters of his battalion in Marsa Matruh. Although transferred to a hospital in Alexandria, he was pronounced dead upon arrival. According to Baha's brother, Cyril, the Coptic soldier had recently told him that he had gotten into arguments with Muslim soldiers in his unit and that one had threatened him with death. Baha is certainly not the first Coptic Christian serving in his country's military to be killed over his religious identity. Two months earlier, on June 24, the only Christian in his army unit was found shot dead in a chair at the office of the military base he was stationed. Bahaa Gamal Mikhail Silvanus, a 23-year-old conscript, had two gunshot wounds and a gun at his feet. Relatives who later saw the body said he also had wounds atop his head, as if he had been bludgeoned with an object. In most cases, the Egyptian military claims that murdered Christian soldiers committed suicide. The military's official position was that the Copt committed suicide—despite the fact that suicides are rarely able to shoot themselves twice or first hit themselves atop the head with blunt objects. Moreover, according to Rev. Mikhial Shenouda, who knew the deceased, "A person who commits suicide is a disappointed and desperate person, but Baha was in very good spirits. He was smiling always. He was keeping the word of God," and planning on entering the monastic life after his military service. A friend of the deceased Christian said that Silvanus had confided to him that he was regularly pressured by other soldiers in his unit to convert to Islam: "He told me that the persecution of the fanatical Muslim conscripts in the battalion against him had increased ... and that they would kill him if he wouldn't convert to Islam." On August 31, 2013, another Copt in the armed services, Abu al-Khair Atta, was killed in his unit by an "extremist officer" for "refusing to convert to Islam." Again, the interior ministry informed the slain Copt's family that he had committed suicide. However, Abu al-Khair's father, citing eyewitnesses who spoke to him, said that "one of the radical, fanatical officers pressured and threatened him on more than one occasion to convert to Islam. Abu al-Khair resisted the threats, which vexed the officer more." Then there was 20-year-old Guirgus Rizq Yusif al-Maqar, who died on September 18, 2006. Without notifying him why, the armed forces summoned his handicapped father to the station in Asyut. After making the arduous journey, he was verbally mistreated by some officers and then bluntly told, "Go take your son's corpse from the refrigerator!" The father "collapsed from the horror of the news." Officials claimed the youth died of a sudden drop in blood pressure. Later, however, while family members were washing Guirgus' body, they discovered wounds on his shoulders and a large black swelling around his testicles. Assuming these were products of injuries incurred during harsh training, his family proceeded to bury him. Later, however, a colleague of the deceased told them that Guirgus was regularly insulted, humiliated, and beaten—including on his testicles—simply because he was Christian. The dead youth's family implored authorities to exhume Guirgus' body for a forensic examination but was denied. 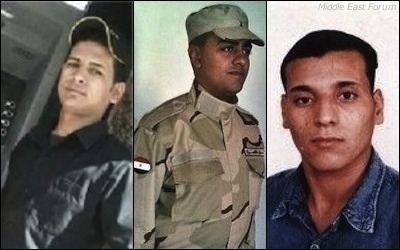 And on August 2006, the mutilated and drowned body of another Copt serving in the Egyptian military, Hany Seroufim, was found. Earlier he had confided to his family that he was being insulted and abused for being a Christian by his commander, both in public and in private. According to MCN, "His unit commander ordered him to renounce Christianity and join the ranks of Islam." The Coptic youth refused, warning his Muslim commander: "I will notify military intelligence about this," to which his superior replied, "Okay, Hani; soon I will settle my account with you." His body was later found floating in the Nile covered with signs of torture. For Muslims who equate war with jihad, having non-Muslims fighting alongside them is unacceptable. It should come as no surprise that some Muslim soldiers insist that the men fighting alongside them be Muslims as well. "Infidels" are seen as untrustworthy fifth columns (hence why Islamic law holds that non-Muslim subjects, or dhimmis, are forbidden from owning weapons). In Islam, allegiance belongs to the Umma—the abstract "Muslim world" that transcends racial, linguistic, and territorial borders—and not to any particular Muslim nation. Thus it may seem reasonable for all Egyptian citizens—Muslims and Christians alike—to serve in their nation's military. But for Muslims who equate "war" with "jihad," having non-Muslims fighting alongside them is unacceptable—hence the aforementioned anecdotes of pressure on Christian soldiers to convert to Islam. Nor is this sort of thinking limited to Egypt. In Kuwait, no one can become a citizen without first converting to Islam, and indigenous Kuwaitis who openly leave Islam lose their citizenship. In nations as diverse as Iran and Sudan, prominent church leaders are regularly persecuted, some put on death row, on the accusation that, because they are not Muslim, they must be treasonous agitators working for the West (which, in the popular Muslim mind, continues to be conflated with Christianity). Finally, all these modern day slayings of Christian soldiers who refuse to convert to Islam thoroughly contradict the historic narrative being peddled by Mideast academics in America. Put differently, the present sheds light on the past. In an attempt to whitewash the meaning of jizya—the extortion money non-Muslims redeemed their lives with—Georgetown University's John Esposito writes that jizya was actually paid to "exempt them [non-Muslims] from military service." Similarly, Sohaib Sultan, Princeton University's Muslim chaplain, asserts that jizya was merely "an exemption tax in lieu of military service." Such assertions are absurd: Muslim overlords never wanted their conquered and despised "infidel" subjects to fight alongside them in the name of jihad—holy war against infidels, such as the conquered subjects themselves—without first converting to Islam. That's how it was in the past, and, increasingly, the way it is in the present.